A large body of empirical research has been performed regarding the effects of union membership changes, union organizing and right-to-work laws. Work by such scholars as William Dickens and Jonathan Leonard, Richard Freeman, Henry Farber, Edward Lazear, Melvin Reder, and Paul Jarley and Jack Fiorito offer a fairly clear conclusion that right-to-work legislation reduces measures of private-sector unionization and union-related activities such as organizing. Newman (referenced above) tested the effect of right-to-work laws on the economic growth in manufacturing industries in southern states in roughly the two decades following the Taft-Hartley Act. The study, which controlled for taxation and unionization rates, found that right-to-work laws were a significant contributor to growth, and that this effect was more pronounced in labor-intensive industries. The most recent research on the impact of right-to-work laws is more mixed. A 2009 study by Lonnie K. Stevans — which carefully attempted to control for endogeneity — analyzed state data from 1990, 1995, and 2000 through 2005. He found that there were no wage or employment effects of right-to-work laws. In 2011, however, Richard Vedder, Matthew Denhart and Jonathan Robe studied the impact of right-to-work using a model that analyzed the lower 48 states from 1977 through 2008. 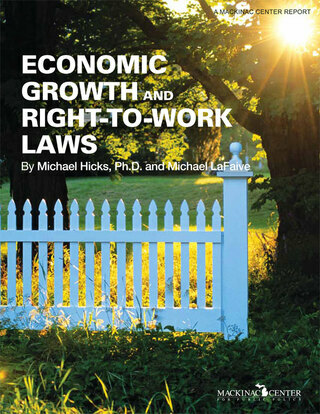 They found that right-to-work laws increased economic growth rates by 11.5 percent. In 2012, this co-author (Hicks) estimated the impact of right-to-work on manufacturing employment, manufacturing incomes and the share of manufacturing income in states from 1929 through 2005. This study examined the actual effect of right-to-work laws using an identification strategy which isolated southern states and 1947 manufacturing employment to account for political factors which may have contributed to the passage of right-to-work. This analysis found no impacts on aggregate manufacturing employment, manufacturing incomes or the share of manufacturing income. However, right-to-work laws produced a statistically meaningful contribution to manufacturing income growth in the majority of states which had adopted the legislation since 1950. [*] The Mackinac Center for Public Policy first published on this subject in 1992. George Leef, "Protecting the Political Freedom of Workers," (Mackinac Center for Public Policy, 1992), http://www.mackinac.org/183 (accessed Aug. 20, 2013). Since then, it has produced hundreds of articles, studies, blog posts, press releases and videos on the topic. A keyword search for “right-to-work” on its Web site generates 781 matches. [†] These statistics are based on the latest available data at the time of this writing. Oklahoma, which became a right-to-work state in 2001, was not included in the analyses. [‡] For more information, see: Michael LaFaive, "Right-to-Work Laws Influence Migration," (Mackinac Center for Public Policy, 2012), http://goo.gl/xxIA4 (accessed July 30, 2013). [§] William J. Moore, "The Determinants and Effects of Right-to-Work Laws: A Review of the Recent Literature," Journal of Labor Research 19, no. 3 (1998). This was Moore’s second literature review of the effects of right-to-work laws. His first was published in in 1985 with co-author Robert Newman. William J. Moore and Robert J. Newman, "The Effects of Right-to-Work Laws: A Review of the Literature," Industrial and Labor Relations Review 38, no. 4 (1985). [¶] As mentioned above, Moore effectively dismissed results that did not find a significant positive effect, because they examined short time frames.